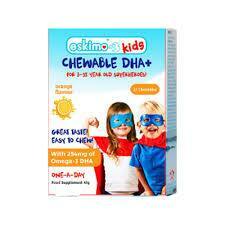 Eskimo-3 Kids Chewable DHA orange flavoured, combines brain boosting Omega fatty acid DHA and EPA. Omega fatty acids are ideal way to help support your child’s health, brain function and all-round ability. Children 3-12 years: One chewable daily.